Steinjager is an American based company located in Bushnell, IL. Relying on decades of manufacturing manufacturing tubular fabrications, bar fabrications, push-pull cables, and spherical rod end bearings, Steinjager products are high quality, great value, and MADE IN THE USA! Many confuse the Steinjager logo and name for a forgein company, but nothing could be farther from the truth. The Steinjager name is made up of the combination of two German words. Stein means rock and Jager means hunter in German. 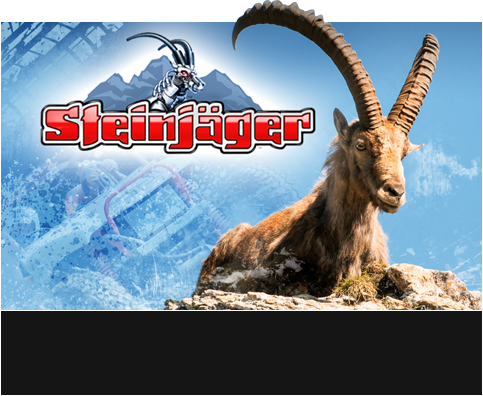 Their logo is the might ibex which can be found in the treacherous Austrian Alps mountain range. No other animal in the world can endure such harsh and unforgiving conditions with the speed, agility, and extraordinary resilience like the ibex. When you outfit your vehicle with ultra rugged Steinjager products, it will also have these characterics along. If you want the best products your money can buy and support American manufacturing, buy Steinjager!